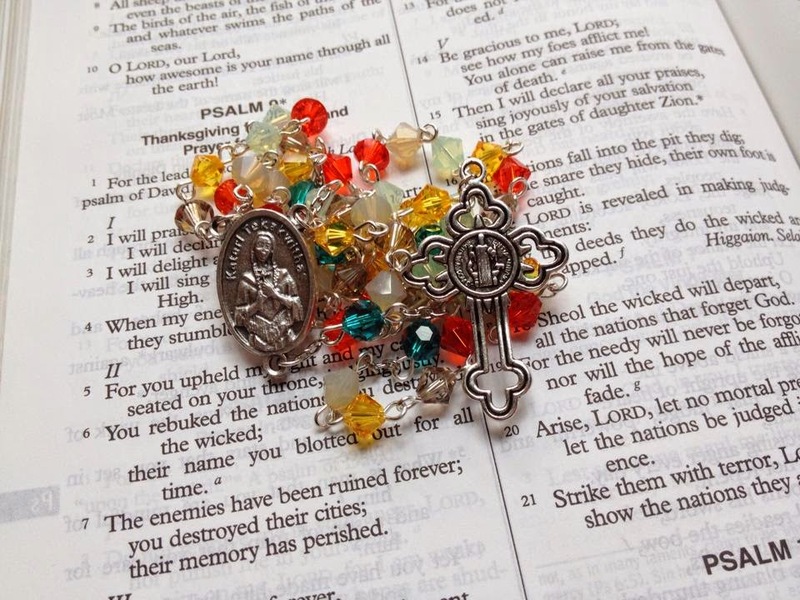 Life of a Catholic Librarian: Happy feast of St. Kateri! 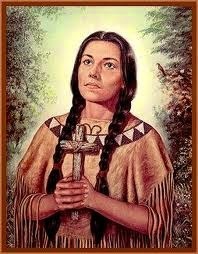 Happy feast of St. Kateri! Today is a big feast day, y'all. :0 St. Kateri Tekakwitha, the "Lily of the Mohawks," patron of the environment, first Native American consecrated virgin, and whose cause for canonization was championed by St. John Paul II as a source of inspiration for all Catholics of indigenous heritage. You can read her story many places on the web, including the link I provided above, but what I take most from it is the difficult life that she led, losing her parents at a young age and being physically scarred from her battle with smallpox. Also, how strong her young faith was when she encountered resistance from her people with regard to her conversion. I am so enamored with saints who were devoted to the Eucharist, and St. Kateri is well known for falling into this category. I love that she started a community for like-minded women before her death, and her influence spread far beyond the small areas of modern New York State and Quebec, Canada in which she lived. 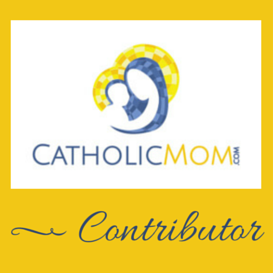 St. Kateri has much personal meaning to me, as I noted in the post I wrote about my family's faith story. My paternal grandfather was Mohawk, and that angle of my family's genealogy has always been of great interest to me and my sisters. When my dad came into the Church back in the early 90's, I remember the Mass in which he was confirmed very well. My dad is a very reserved person, quiet and unassuming, and he didn't want to take part in a large Easter Vigil Mass. At the time, we were members of a small parish on the nearby Tuscarora reservation, and there was no Easter Vigil Mass scheduled there anyway, we would have to go to the large nearby Marian shrine whose religious order, the Barnabites, donated the time of one of their priests to say Mass on the reservation. So this would mean a *very* large Easter Vigil. Instead, the priest offered to say a private Mass during Easter season for us, during which my dad would be received into the Church. And that's what we did. I remember being at the shrine and thinking how different it felt from when I was usually there, because the church was devoid of all people aside from us, and usually it is bustling with visitors. When we got to the Rite of the Sacraments of Initiation, the priest paused to say a few words about how he had come to know my dad, and how he had enjoyed the instruction classes they had journeyed through together. 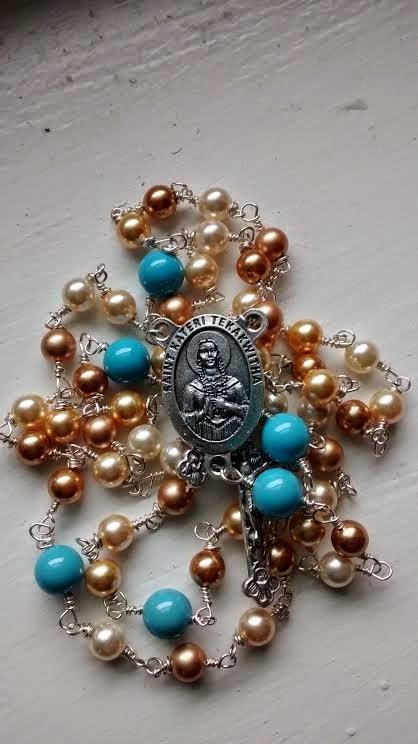 Then he said that he loved the saint my dad had chosen as his confirmation patron, and in my mind I thought: "Oh yes, he chose St. Andrew," because that was my great-grandfather's name, and I knew that my dad had been planning to use it in honor of him. 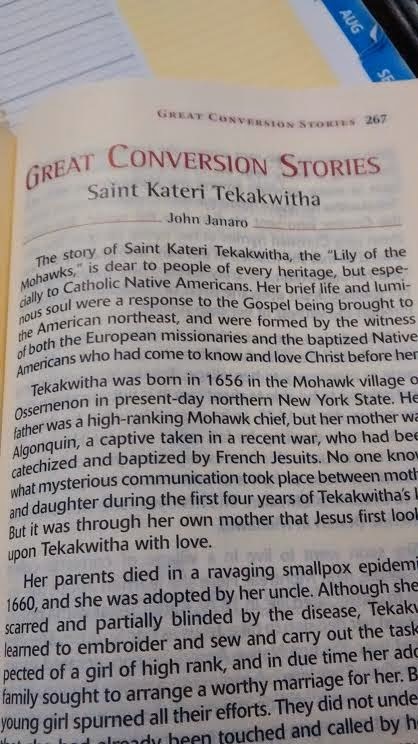 But then Father said: "He chose [at that time] Blessed Kateri Tekakwitha..."
And I remember being surprised that he had changed his mind, but then thinking "Oh, of course. That makes perfect sense." St. Kateri is so special to me. 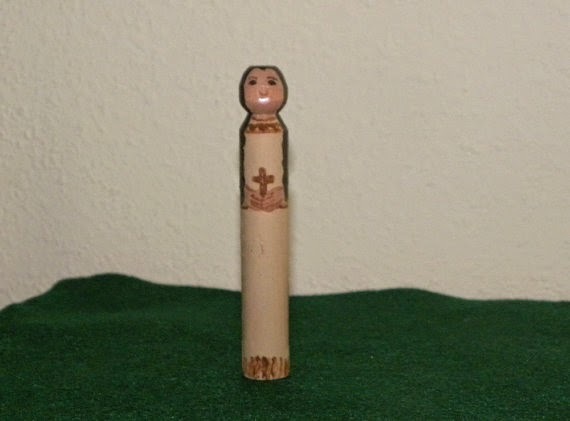 I have a saint peg doll bearing her likeness on my desk at work, on a key chain for my house key, and on multiple rosary centerpieces. I use the images to call to mind her life and faith while recollecting in prayer or going about my daily tasks, so that I can better try to emulate her strong faith and courage. St. Kateri, pray for us! Wait, what was I supposed to be writing about?! "Mommy, I am NOT GOING TO SLEEP"